Unlike the previous year’s snowy conditions, the dry and surprisingly mild weather was ideal for two walks of roughly three- and five-mile round trips, all meeting up at Fruitfields, just along from Upper Bittell Reservoir. With warming mulled apple juice and cider, a crackling bonfire and the stars just starting to twitch, everyone wished the health of the apple trees by processing around the orchard, banging pots and pans. Led by a drum and melodeon, they hung toast in the oldest trees to cast away evil spirits and give the birds a few extra crumbs! 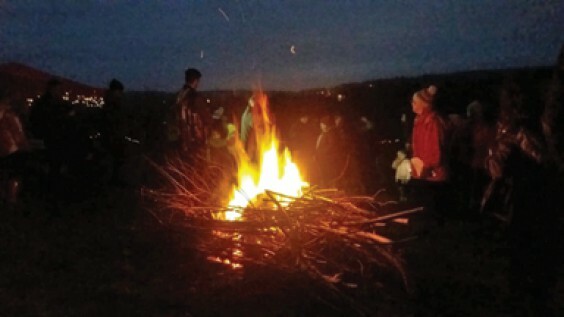 Fruitfields and Barnt Green Parish Council hope the event will be an annual fixture, so look out for details in December 2019!